George’s Marvellous Medicine is set to delight children of 6+ and grown-ups alike at West Yorkshire Playhouse this Spring, in a new adaptation from Roald Dahl’s celebrated short story. 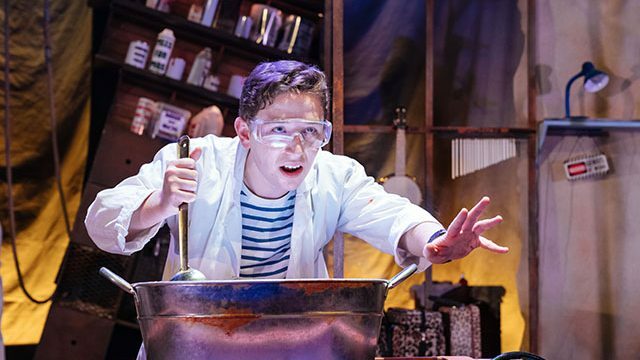 Bursting with growing grannies, feathery farm animals and bags of frothbuggling family fun, Curve and Rose Theatre Kingston’s George’s Marvellous Medicine is filled with adventure as plucky George contends with his grumbling, grouchy Grandma. Preston Nyman as George. Credit: Manuel Harlan. Following the success of Fantastic Mr Fox, The Twits and The Witches, Curve’s magnificent new co-production with Rose Theatre Kingston promises to be yet another hugely imaginative and entertaining stage adaptation. George’s Marvellous Medicine is at West Yorkshire Playhouse from Tuesday 13th to Saturday 17th March 2018. Book online at wyp.org.uk or call the Box office on 0113 213 7700.